The department of the Dordogne in south-west France is justly famous for its pretty villages, cave paintings, elegant towns and landscapes of river valleys and quiet countryside. 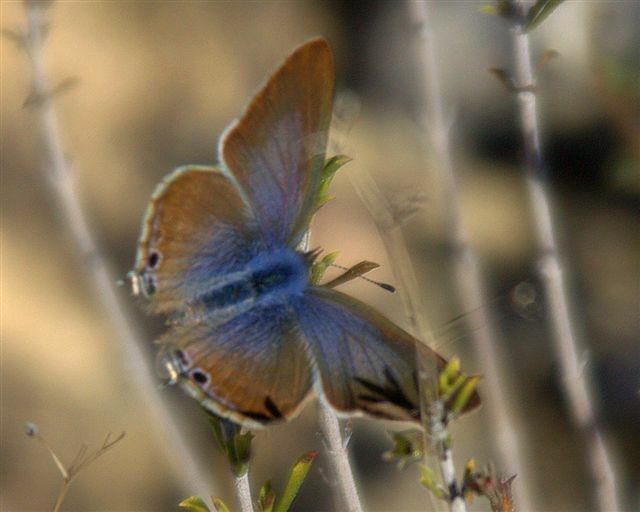 Less discovered is the wildlife: a charming mix of flowers, birds and butterflies. The above is a sentence written for our usual May holiday here, and 'less discovered' especially applies for our first — and probably our last — visit in September. This is something of a sentimental journal to enjoy Castang and the company (and cooking) of our hosts Keith and Cathy in what is expected to be their final season running one of Honeyguide's favourite holiday bases. 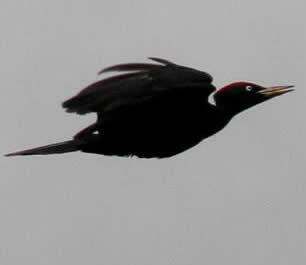 Castang, black woodpecker (Bruce Bennett). Castang is a hamlet close to the Dordogne river above the village of Le Coux et Bigaroque, not far from St Cyprien. Cathy and Keith Parker are our hosts; Cathy is from Montcaret, a little farther west along the Dordogne valley, and Keith is from England. The house was once a Perigordian tobacco farm of great character and charm, parts of which are thought to be more then 400 years old. The farmhouse, together with its complex of converted barns, provides comfortable accommodation around a sunny terraced courtyard. Dinner, after a leisurely aperitif, is one of Castang's great features. Five courses of the best of the region's cuisine, from soup to dessert, accompanied by local wines, are prepared and cooked by Cathy. Castang's large meadow is rich in orchids and butterflies in the spring. The orchids will be long gone but there'll be plenty of butterflies and other invertebrates to study in early autumn. Beyond the orchid field, the area is a mix of meadows, cropped land and woods, cut by the wide river valleys of the Vézère and Dordogne. Adonis blue; woodland grayling. More Dordogne butterflies here. September blooms are likely to be a mixture of late-lingering flowers such as marjoram and scabiouses, ruderal species like chicory and, perhaps, the occasional autumn-flowering speciality to be discovered. Shrubs include dogwood, fly honeysuckle and Montpelier maple. Black redstarts, serins, crag martins and buzzards are likely close to home. We hope for autumn migrants moving through, such as flycatchers and warblers, plus common sandpipers and grey wagtails by rivers. We know red squirrels are in the area and autumn can be a good time to see them, when there are young animals around. Wall lizards are easy to see; fire salamanders need wet conditions. 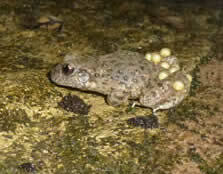 Will the local midwife toads still be active? We'll find out! Common wall lizard at Castang. Familiar butterflies on the wing in September are likely to include swallowtails, several species of whites, clouded yellows, wall brown and southern speckled woods. There should be a selection of blues, too: Adonis, common, long-tailed and perhaps geranium bronze. It's a good time of year for graylings: common, woodland and great banded graylings are possible. 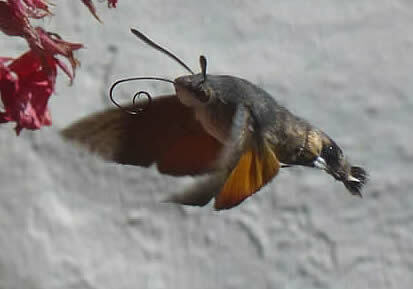 Other invertebrates will include hummingbird hawkmoth and many grasshoppers and crickets. 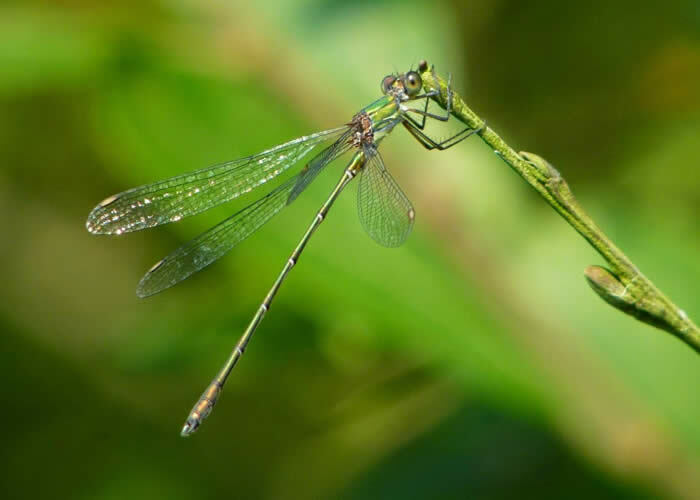 We expect to see a range of later-emerging dragonflies and damselflies, such as common and red-veined darters, broad scarlet and western willow spreadwing. 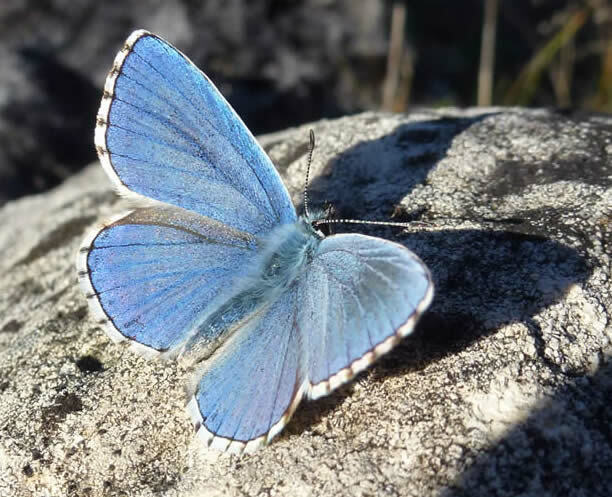 The gorgeous violet dropwing has reached the Dordogne: could we be lucky? 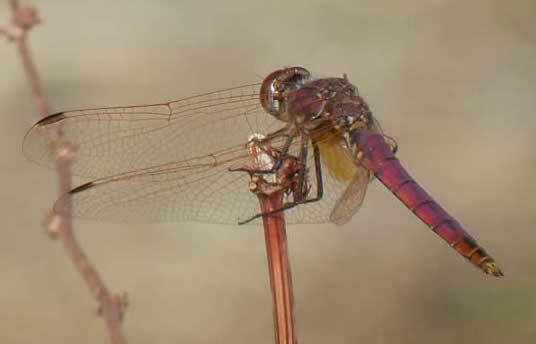 Western willow spreadwing; red-veined darter. The itinerary is still being planned, though as usual will include walks around Castang. A little farther afield, walks can be combined with visits to the village of Limeuil, at the confluence of the Vézère and Dordogne rivers, and a morning on market day in the town of Le Bugue. Thought is being given to any visits that link the the Dordogne's famous history and prehistory (perhaps where spring groups haven't visited) and wildlife, for example where we know these are near to each other such as at Roque St Christophe. Single room supplement (two only): £150. 19 September: FR8592 depart London Stansted 12:15 arrive Bergerac 15:00. 26 September: FR8593 depart Bergerac 15:25 arrive Stansted 16:10. Scheduled Flybe flights from Southampton are presently also possible. If you know of flights from other UK airports, possibly involving an extended stay in France, or if you'd like to travel by car or train, please say! Chris Durdin is the driving force behind Honeyguide, running holidays since 1991. For many years he combined this with his work for the RSPB in Eastern England, often the Society’s spokesman, but has been concentrating on Honeyguide full-time since 2009. He has written a book about Norfolk’s cranes and leads regular walks on his local wildlife trust nature reserve. He’s also a qualified soccer coach, for one son’s under 16 year group. As a naturalist, Chris is an all rounder. The holiday supports the 'Refuges LPO' project of La Ligue pour la Protection des Oiseaux (French Bird Protection League). LPO has set up a network of no-hunting sanctuaries throughout France and is battling French hunters to prevent an extension of the shooting season into the spring. In recent years the focus of 'Refuges LPO' has been more on encouraging management for wildlife on land in private ownership - what in the UK we might call making a back garden nature reserve. Biosphere Reserve: the Dordogne Basin is one of 13 Biosphere Reserves in France, declared by UNESCO in 2012. More details here. Biosphere Reserves are where nature with human activities alongside are considered well-managed, and are "Learning Sites for Sustainable Development." Others which are Honeyguide destinations include the Cévennes and the Camargue. There are five Biosphere Reserves in the UK: the North Norfolk Coast is one. 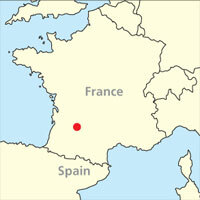 FCO travel advice for France here. 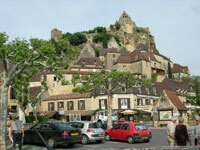 More Dordogne holiday reports here. Download history and geography notes about places we visit here. Photos on Facebook, May 2018. Dordogne movie from May 2016 by David Lovell here. Photos here by Honeyguider Steve Kourik from May 2011 and here by Honeyguider Brennan Aunger from May 2012. An abandoned pigeonier (dove-cote) in a field close to Castang. Violet dropwing has colonised the Dordogne: could we be lucky? Photo taken in Extremadura. More on the 'Refuges LPO' project (in French) here. Thank-you letter for our donation in 2010 here.